Steven Isserlis became Patron of the JdP in 1998, and each year he plays a recital to a packed Edward Boyle Auditorium. 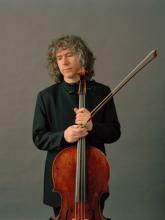 Acclaimed worldwide for his profound musicianship and technical mastery, British cellist Steven Isserlis enjoys a distinguished career as a soloist, chamber musician, educator, author and broadcaster. He recently performed the complete Bach Cello Suites at the JdP and continues to enjoy performing in this unique space built in honour of a cellist who was very dear to him.